GAPDH antibodies and recombinant antigens: an investigative tool plus loading control in clinical research. - Advanced ImmunoChemical Inc.Advanced ImmunoChemical Inc.
Home » Assay Notes » GAPDH antibodies and recombinant antigens: an investigative tool plus loading control in clinical research. GAPDH antibodies and recombinant antigens: an investigative tool plus loading control in clinical research. 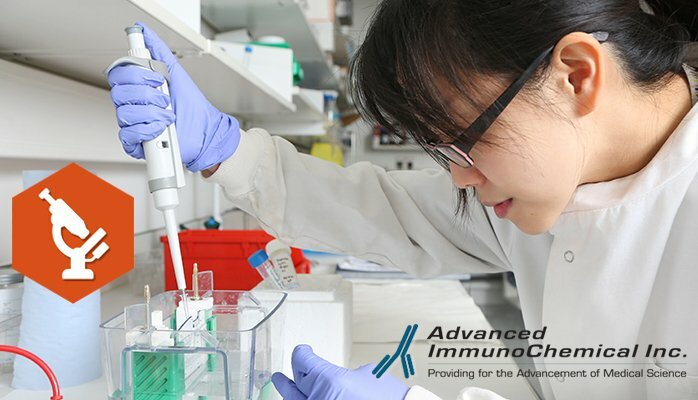 Advanced ImmunoChemical offers 5 monoclonal antibodies, in addition to the recombinant human and recombinant rabbit antigens, for the detection of glyceraldehyde-3-phosphate dehydrogenase, an enzyme known for its catalyzing role in glycolysis. These antibodies and antigens are sufficient for immunodetection of GAPDH by Western blotting, sandwich immunoassays, and other immunocytochemical processes. Glyceraldehyde-3-phosphate dehydrogenase is a homotetramer with a total molecular weight of 144 kDa, and subunits at about 36 kDa. GAPDH is well-known for its function in modifying glyceraldehyde-3-phosphate into 1,3-bisphosphoglycerate in conjunction with the reduction of NAD+ into NADH during the process of glycolysis (1). Being a highly-conserved, high abundance protein, GAPDH has shown to be expressed in high levels in many cancer cells, proving its usefulness as a loading control in medical research (2). Research has shown a link between GAPDH expression and neurological diseases such as Alzheimer’s and Huntington’s disease. The development of Alzheimer’s is driven by mitochondrial dysfunction and the death of neurons, supplied by the accumulation of beta amyloids into plaques built up on these cells. The formation of beta amyloids, or beta-amyloidogenesis, is a process facilitated by GAPDH aggregates (3). There also exists a role of GAPDH-driven mitophagy in the generation of Huntington’s disease, as inactivated GAPDH expressed in these cells have shown to enhance the survival and function of cell cultures in models of the disease (4). NEW!! !Advanced ImmunoChemical now offers a GAPDH Western blot set, complete with a 5-minute protocol for GAPDH immunodetection, anti-GAPDH MAb 6C5, and human antigen! (1) Gani, Z. et al. (2016). Purification and characterization of glyceraldehyde-3-phosphate-dehydrogenase (GAPDH) from pea seeds. Protein Expr Purif 127: 22-27. (2) Seidler, N.W. (2013). Basic biology of GAPDH. Adv Exp Med Biol 985: 1-36. (3) Itakura, M. et al (2015). Glyceraldehyde-3-phosphate dehydrogenase aggregates accelerate amyloid-β amyloidogenesis in Alzheimer disease. J Biol Chem 290(43): 26072-87. (4) Hwang, S. et al. (2015). Impaired GAPDH-induced mitophagy contributes to the pathology of Huntington’s disease. EMBO Mol Med 7(10): 1307-26.